Sciatica refers to the pain caused by the compression or irritation in the nerves at the lower end of the spine. Sciatica is also known as radiculopathy, which refers to the extension of the spinal disc beyond the normal position, resulting in the pressure on the sciatic nerve. Such a condition can often result in pain in the back and legs. The best remedy for the treatment of this kind of pain is sciatica exercises. It is often believed that bed rest helps in such a condition. However, inactivity usually worsens the pain in sciatica patients. Lack of movement weakens the back muscles and the spinal structures, thus resulting in increased pressure on the back and consequently more pain. Sciatica exercises are very important for health and fitness of the human back and spine. Sciatica exercises focus on strengthening the abdominal and back muscles. These exercises include stretching, which helps in improving the flexibility of the back muscles, resulting in reduced pain. Doctors recommend different exercises for sciatica patients, depending on the cause of sciatica, which can also occur due to serious medical conditions such as an infection or tumor. One has to do these exercises regularly and in a proper manner in order to derive maximum benefit. Exercising regularly not only helps in the treatment of sciatica-related pain, but also helps in the prevention of any such problems in the future. The most common sciatica exercises that are recommended for the treatment of sciatica-related pain are the Hamstring stretching exercises. The hamstrings are the muscles located in the back of the thigh and help in bending the knee. You must also perform exercises to strengthen the abdominal muscles in order to get relief from the sciatica pain. When standing up becomes a great difficulty and causes excruciating pain, or a mere sitting down can make the pain unbearably worse, chances are, it’s sciatica. Most likely, a person is suffering from sciatica when he or she experiences tremendous pain even while doing simple body movements. Sciatica or sciatic nerve pain is a condition in which the sciatic nerves in the body become inflamed. Sciatic nerves are found beginning at the lower spine and continue down the buttocks area, back of the legs, and into the feet. Symptoms of sciatica is characterized by a light tingling feeling or burning sensation to a full blown shooting pain that travels from the lower back, buttocks area, back of legs, and/or feet. More often than not, sciatic nerve pain affects only one side, although it could also be possible to run down both legs. 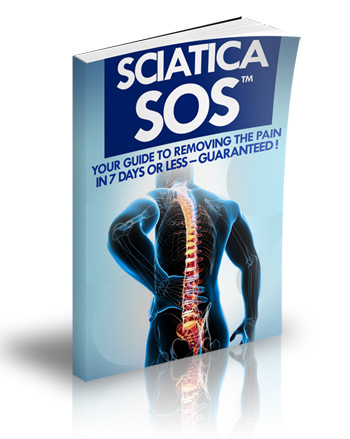 Sciatica could be a frightening experience especially if you do not realize what is happening. One may begin to feel like becoming nearly crippled. However, most of the time, sciatica can be treated effectively. Sciatica may occur when the nerve in the lower spine is pinched, or if there is a slipped disk. Arthritis or a sprained ligament will narrow the passageways of the nerves which may cause the nerve endings to become tender and inflamed. Other causes of sciatica, however rare, include an abscess, growth, or blood clot. Since sciatic nerve pain is caused by pressure and inflammation on the nerve root, sciatic pain relief treatment is generally focused on relieving both of these symptoms through surgical or non-surgical methods. Non-surgical sciatic pain relief treatment may include one or a combination of medical treatments and alternative, non-medical treatments. Most of the time, it includes some form of exercise and stretching. If you are experiencing sciatica, it advisable to stay off your feet for the first few days. One of the things you must avoid is to get up and down repeatedly as this will only cause the nerve to become more irritated. Though some quarters pose questions on the benefits of bed rest, it is still advisable at least for the first few days. It may also feel soothing to soak in warm baths to ease the pain. However, do not use heating pads while the nerve is inflamed. Prolonged heat will draw the inflammation in and will keep the swelling high. Rather, most healthcare professionals would advise the application of ice packs directly on the lower back area for 20 minutes at a time, every couple of hours. This may feel a little uncomfortable, but the cold packs will greatly help in reducing the swelling. Using mineral ice is also a good alternative in soothing the pain and offers a temporary sciatic relief. Though some doctors may prescribe muscle relaxants for temporary relief of pain, caution is advised to prevent unnecessary side effects. Some medications can be addictive, or may give a false sense of feeling better. Massage therapy is another method that is considered to be a highly effective non-surgical sciatic pain relief treatment. Massage treatments can keep your spine in better alignment for longer periods of time. As soon as your back begins to heal, your doctor may give you stretching and low impact exercises so that your muscles won’t stiffen too much. Be sure to engage in exercise only when your doctors approve it. Alternative sciatic pain relief treatments that you might find available and helpful are acupressure, acupuncture, herbal therapies, homeopathy, biofeedback, and guided imagery to name just a few. Surgical methods to remove the portion of the disc that is irritating the nerve root are microdiscectomy or lumbar laminectomy, and discectomy. Surgery helps relieve both the pressure and the inflammation especially if the sciatic nerve pain is severe and has not been relieved through medical treatments. The low back pain is the second most common ailment affecting 80% of the general United States population at some point in life. The pain may either be acute or chronic and is usually caused by a variety of diseases and disorders of the lumbar spine. Low Back pain is usually accompanied by sciatica. Sciatica is a pain that involves the sciatic nerve and affects the lower back, the back of the thighs and buttocks. The patient of low back pain may experience two types of pain, primarily – acute and chronic. A sprain or a muscle tear, which can be aggravated by heavy lifting or extended use of back muscles within 24 hours of the injury, leading to muscle spasms or soreness. Usually improves when you provide rest to the affected area. 1.Mechanical Obesity, pregnancy, bad postures while bending, or stooping causes strain on the lower back muscles. 2.Malignancy Low back pain that is not relieved even after a night’s rest, maybe caused by a tumor in the cauda equine (the roots of the spinal nerves controlling sensation in and movement of the legs), or cancer of the prostate, breasts or lungs, maybe caused because of a history of smoking, sudden weight loss or old age. 3.Herniated Spinal Disk When the spinal disk begins to bulge outward between the vertebrae. This is a common cause of chronic back pain in adults. 4.Ankylosing Spondylitis Pain caused while lying down or sitting; improves when the patient starts moving, is commonly seen in males between the age group of 16-35 years. 5.Psychogenic Back pain which may be induced due to an exaggerated minor injury or that may be usually prolonged leading to somatoform disorder or other psychiatric disturbances. 6.Lower Back Pain with Leg Involvement When the back pain radiates down the leg, the sciatic nerve is usually irritated by herniated disks, tumors of the cauda equina, abscesses in the space between the spinal cord and its covering, spinal stenosis, and compression fractures. Some patients may also experience weakness or lack of feeling, along with pain in the leg.